The Global Soft Drinks Packaging Market is expected to grow at a CAGR of 3.96%, during the forecast period of 2018-2023. The report discusses about the various materials used for soft drink packaging and the type of packaging solutions. While the regions considered in the scope of the report include North America, Europe, and various others. The study also emphasizes on how growing consumption in emerging economies is affecting the market. The carbonated soft drinks (CSD) market has reached a mature stage in the beverages market. In recent years it has gone through multiple changes, and this state of flux is expected to continue in the near future. In recent years, consumers are progressively becoming health-conscious. From consuming juices to rejuvenating carbonated beverages through the day, consumers are now spending more on products that keep them refreshed, and are safe to consume. Keeping these trends in mind, some companies are launching healthier versions of carbonated drinks to fulfill the consumer demand; this creates a high demand for packaging solutions in the industry. In addition, demand for convenient packaging solutions is also propelling the technological advancements in the market. However, the market is likely to face challenges from government regulations and consumer demand, pushing manufacturers to look for products that are biodegradable or derived from sustainable sources. Increased usage of consumer goods, such as soft drinks, due to changing lifestyles, is driving the soft drinks packaging market. 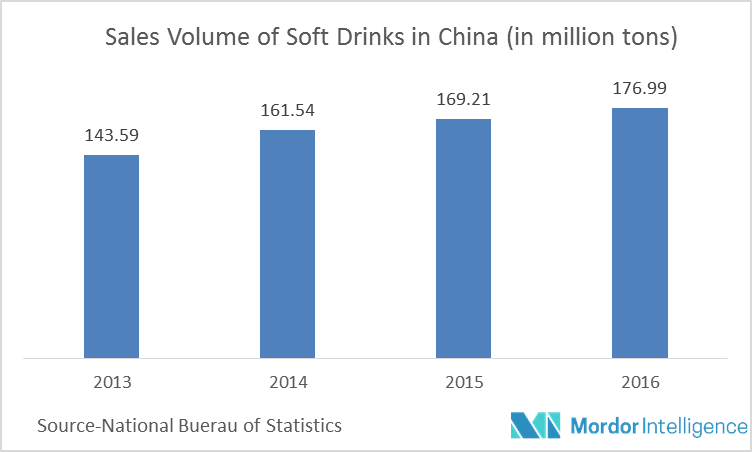 Increase in disposable income across different countries, such as India and China has contributed to the increase in demand for soft drink beverages as well. Also, the growing markets for consumer products, and an expanding population of youthful consumers in these regions are driving the demand for soft drinks. Moreover, the rapid paced urbanization, perceived and proven functionality of soft drinks, and strong marketing & communication strategies of market players are augmenting the growth of soft drinks consumption in the emerging economies. Consumer preference for plastic packaging in the soft drinks industry has been observed over other products in, as plastic packages are lightweight and easier to handle. Also, the major manufacturers prefer to use plastic packaging solutions, as the cost of production is significantly lower. Recent years has seen a growth in awareness about environmental concerns raised by the usage of plastic remains the major constraint for the growth of this industry. This has led to the advent of eco-friendly & biodegradable plastics. Furthermore, significant amount of plastic products are being recycled & reused in the recent years. In addition, the variety of plastics available for packaging, such as PVC, PE, PP, PS, PET, and nylon is also one of the reasons contributing to the market share of this segment. Bottle packaging is witnessing increasing demand owing to plastic material, specifically, PET. These bottles are outpacing the growth of other packaging materials because of its flexibility in form and size, especially in beverages when compared to other types, such as cans. The re-closability provided by bottles for on-the-go convenience is a pertinent, core strength of the format. Also, the demand glass bottles owing to its nonporous, impermeable, and inertness to chemicals present in soft drinks further increases the demand for bottle packaging. However, a survey by Greenpeace has revealed that five of six global soft drink firms sold single-use plastic bottles weighing more than two million tons, only 6.6% of which was recycled plastic. This is expected to act as a challenge for the bottle packaging method. Major Players: Amcor, Ltd, Toyo Seikan Group Holdings Ltd, Graham Packaging Company, Ball Corporation, Pacific Can China Holdings Limited, Owens-Illinois Inc., Crown Holdings Incorporated, Can-Pack S.A, Graham Packaging Company, And CKS Packaging, Inc., amongst others. 6.2 Toyo Seikan Group Holdings Ltd.